Location/ Directions: I-635 - EXIT 13 toward Jupiter Rd - Property is on the right hand side. 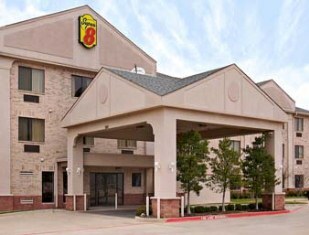 About Hotel: 3-Floors, 60-Rooms, Interior Corridors, Free Breakfast, Elevator, Ice Machine, Vending Machines, Wake-Up Calls, Fitness Center, Hot Tub, Indoor Heated Pool, Bus/RV/Truck Parking, Outdoor Parking, No Pets Allowed, Bath Tub, Hairdryer, Free Local Telephone Calls, Air Conditioning, Alarm Clock, Connecting Rooms, Cribs Available, Desk, Rollaways, Self Controled Heating/Cooling, Iron/Iron Board, In Room-Coffee/Tea Maker, Microwave, Mini Refrigerator, High Speed Internet Access, Color Cable/Satellite TV. Railroad View: Excellent View! Best rooms to view the railroad will be on the 2nd & 3rd floors, rear side of the building closest to the railroad. All rooms on the front of the building will have some trees fouling some of the view. No rooms face the tracks directly. Railroads past Hotel: Kansas City Southern Railway. Photo Comment:The aerial image shows the Super 8 motel outlined with red. 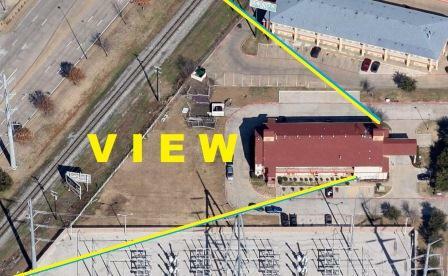 The blue lines show the total view of the railroad from the motel, the best railroad views are marked with yellow. The best rooms will be 2nd & 3rd floor rooms on the rear of the building, closest to the railroad. First floor rooms on the rear are blocked by a brick wall. 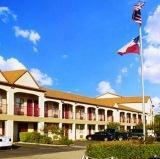 Rooms on the front of the hotel will have some trees between the railroad and the motel parking lot. Location/ Directions: I-635 East, Exit 12, Garland Road. Turn Left at Garland Rd. Property is 2 blocks on the right side..
About Hotel: 3-Floors, 45-Rooms, Interior Corridors, Elevators, Vending Machines, Fitness Center, Outdoor Pool, Business Center, No Pets Allowed, Bath Tub, Hairdryer, Free Local Telephone Calls, Self Controlled Air Conditioning/Heating, Alarm Clock, Connecting Rooms, Cribs Available, Desk, Easy Chair/Recliner, Rollaways, Iron/Iron Board, Free Newspaper, Washer/dryer, In Room-Coffee/Tea Maker, Microwave, Mini Refrigerator, High Speed Internet Access, Color Cable/Satellite TV. Railroad View: Excellent View! Clear view of the railroad next to the motel. While most rooms in the motel will offer a railroad view, Ask for a 2nd or 3rd floor room on the north side (pool side) of the building. South side rooms on the railroad end maybe just as good! Railroads past Hotel: Kansas City Southern Railway / Dallas, Garland & Northeastern Railroad (DGNO, a shortline railroad). Photo Comment: Looking across the railroad to the motel, the Days Inn is the building pictured to the right. As you can see, you will have a clear view of the railroad from 2nd & 3rd floor rooms located on the northside of the motel. Location/ Directions: I-635 East, Exit 12, Garland Road. Turn Left at Garland Rd. Property is 2 blocks on the right side. About Hotel: 2-Floors, 52-Rooms, Exterior Corridors, No other info. Railroad View: Excellent View! Clear view of the railroad next to the motel. 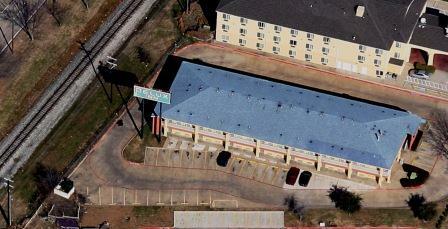 Photo Comment: The aerial image shows the Delux Inn (blue looking roof). While every room in the motel should offer a railroad, upper floor rooms on the south side near the railroad maybe the best to watch passing trains. About Hotel: 2-Floors, 33-Rooms, Interior Corridors,No other info. 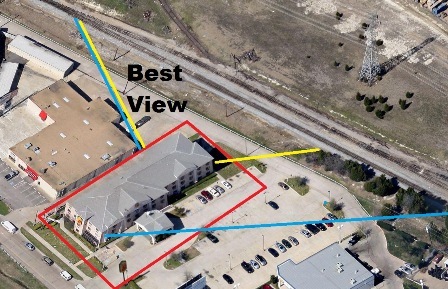 Photo Comment: The aerial view shows the Garland Inn & Suites (red roof) marked by the view of the railroad. Most all rooms in this motel will offer a railroad view. Rooms do not face the tracks directly. 2nd floor rooms will keep you above the parking lot. There is a grassy area near the tracks, if you have a heads up of an approaching train, you maybe able a capture a nice shot of it from the open area. About Hotel: 3-Floors, 100-Rooms, Exterior Corridors, Pool, No other info. Railroad View: Excellent View! Any room on the rear of the motel will offer a clear railroad view. 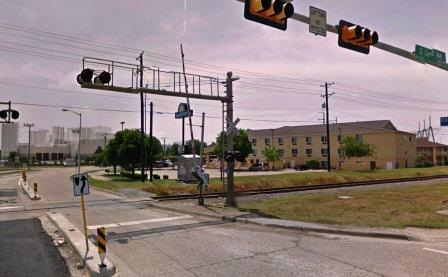 Photo Comment: Looking across to the motel from I-635, the Kingsley Inn & Suites has a clear view of the single track railroad. The actual track is hardly seen in this photo. Google maps shows the track clean, well groomed and shiny rail. I am not sure how many trains pass the motel each day.